The old fashioned Plum Pudding Recipe given below is connected to an unknown sailor's account of how a special Christmas pudding saved his ship from certain destruction in 1839. Whether the old sailor's account is true or not I'll leave you to be the judge. Apparently, the story was originally reported in The New York Times and later reprinted in the Detroit Free Press, so it might bear some truth. Regardless, the old fashioned recipe makes a traditional English Christmas pudding that tastes absolutely delicious, and its colorful history will make a great topic of conversation to top off your festive meal. Your guests will love trying this authentic holiday pudding and enjoy reading the old sailor's story of an unusual sea voyage. 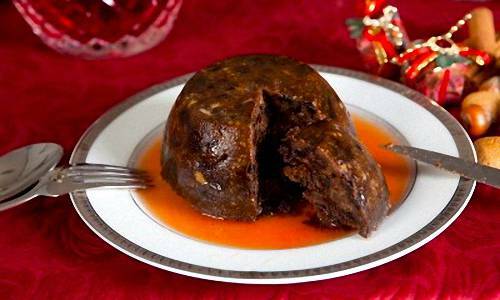 Thanks to the mystery sailor's old fashioned plum pudding recipe, you can enjoy an authentic English Christmas pudding served with brandy or wine sauce. By the way, the answer is "a plum pudding." Dr. Chase: To show the real value of the Old English plum pudding, I take my recipe from the New York Times, as related by a sailor — the second mate on a sailing ship from New York to Liverpool — in which case, of course, even the half of the plum pudding saved (?) the ship and quickly brought all safely to their desired haven. It was about the stormiest voyage I ever see. We left the Hook on November 5, 1839, in a regular blow, and struck worse weather off the Banks (Newfoundland), and it grew dirtier every mile we made. The old man was kind of gruff and anxious like, and wasn't easy to manage. This ain't no Christmas story, and ain't got no moral to it. I was second mate and knowed the captain pretty well, but he wasn't sociable, and the nearer we got to land according to our dead reckoning (for we hadn't been able to take an observation) the more cross-grained he got. I was eating my supper on the 24th, when the steward he comes in, and says he, "Captain, plum pudding tomorrow, as usual sir?" It wouldn't be polite in me to give what that captain replied, but the steward he didn't mind. All that night and next day, the 25th of December, it was a howling storm, and the captain he kept the deck. About 3 o'clock Christmas day dinner was ready, and a precious hard time it was to get that dinner from the galley to the cabin on account of the green seas that swept over the ship. The old man, after a bit, came down, and says he, "Where's the puddin'?" The steward he come in just then as pale as a ghost, and says he showing an empty dish: "Washed overboard, sir." It ain't necessary to repeat what that there captain said. Kind of how it looked as if the old man had wanted to give himself some heart with that pudding, and now there wasn't none. I disremember whether it wasn't a passenger as said "that, providing we only reached port safe, in such a gale puddings was of no consequence." I guess the old man most bit his head off for interfering with the ship's regulations. Just then the cook he came into the cabin with a dish in his hand, saying: "There is another pudding. I halved 'em," and he set a good-sized pudding down on the table. Then the old man kind of unbent and went for that pudding and cut it in big hunks, helping the passenger last, with a kind of triumphant look. He hadn't swallowed more than a single bite than the first mate he comes running down, and says he: "Lizard Light on the starboard bow, and weather brightening up." "Then give her full three points more northerly, sir, and the Lord be praised." And the captain, he swallowed his pudding in three gulps, and was on deck, just saying, "I knowed the pudding would fetch it," and he left us. We was in Liverpool three days after that, though a ship that started the day before us from New York was never heard of. Take six ounces of suet, mind you skin it and cut it up fine. Just you use the same quantity of raisins, taking out the stones, and the same of currants; always wash your currants and dry them in a cloth. Have a stale loaf of bread, and crumble, say three ounces of it. You will want about the same of sifted flour. Break three eggs, yolks and all, but don't beat them much. Have a teaspoonful of ground cinnamon and grate half a nutmeg. Don't forget a teaspoonful of salt. You will require with all this, a half-pint of milk — we kept a cow on board of ship in those days — say to that four ounces of white sugar. In old days angelica root candied was used; it's gone out of fashion now. Put that in — if you have it — not a big piece, and slice it thin. You can't do well without half an ounce of candied citron. Now mix all this up together, adding the milk last, in which you put half a glass of brandy. Take a piece of linen, big enough to double over, put it in boiling water, squeeze out all the water, and flour it; turn out your mixture in that cloth, and tie it up tight; good cooks sew up their pudding bags. It can't be squeezed too much, for a loosely tied pudding is a soggy thing, because it won't cook dry. Put in 5 quarts of boiling water, and let it boil 6 hours steady, covering it up. Watch it, and if the water gives out, add more boiling water. This is a genuine English, old fashioned plum pudding recipe, with no nonsense about it. This dessert sauce not only compliments the plum pudding above, but it is delicious as a topping for use with other dessert puddings also. Sugar, 2 cups, dissolved in boiling water, 1/2 pint, or still better, some of the boiling water in which the pudding was boiled, same amount flavored with vanilla; flour, or cornstarch, 2 tablespoonfuls, worked smooth, in cold water, 1 cup, and stirred into the boiling sugar, with nice butter, the size of an egg (hen's egg); then add two or three tablespoonfuls of good vinegar (more or less as a sharp or mild taste is preferred); or brandy, or good wine, in like quantities to suit the taste of self or guests, with cinnamon, nutmeg, or other flavor, as you like. Remarks. —It has always appeared to the author that an occasional incident like the above sea voyage, in connection with a recipe, or receipt (recipe is the proper spelling, but receipt is much the more common manner of speaking), not only gives relief to the mind from the sameness of the receipts, or descriptions, but also helps one to remember the modus operandi (manner of operation) of the whole instructions and directions of the receipt. An incident like this one here given will also give a subject for conversation, and also call for the relation of other incidents known, or passed through, by some of those who may be gathered around the sideboard, when the Old English plum pudding, "with no nonsense about it," will be reproduced, if at no other time in the whole year. So I trust to be excused for the space the story part of the old fashioned plum pudding recipe or receipt occupies. 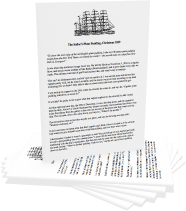 Use the form below to access a secure page where you can instantly download your FREE PDF copy of The Sailor's Plum Pudding story that you can view online or print out for your dinner guests to read. Yes, I wish to access my free copy of Sailor's Plum Pudding. The "Answer" to the old riddle is placed somewhere on this page for you to find.